Syrian President Bashar al-Assad has suggested that some outside governments may urge rebels to attack international inspectors sent into war-fractured country to secure its arsenal of chemical weapons. "There might be countries that might ask the terrorists to attack the inspectors to prevent them from doing their job, and blame the Syrian government," he said in an interview aired Sunday by Chinese state broadcaster CCTV. "At this point, this remains just a possibility and we cannot know until the inspectors arrive in Syria," al-Assad said. The number of Syrians who have fled their war-ravaged country has risen above 2 million, the U.N. refugee agency said Tuesday. That's an increase of nearly 1.8 million people over the past 12 months, the UNHCR said, describing the trend as "alarming." Going it alone against the Syrian government is not what President Barack Obama wants, U.S. Secretary of State Chuck Hagel said Friday. But that scenario is looking more and more likely. A day earlier, the United States' closest ally, Great Britain, backed out of a possible coalition. A U.N. Security Council meeting on Syria ended in deadlock, and in the U.S. Congress, doubts about military intervention are making the rounds. Skeptics are invoking Iraq, where the United States government under President George W. Bush marched to war based on a thin claim that former dictator Saddam Hussein was harboring weapons of mass destruction. Laszlo Csatary, the Nazi war crimes suspect who was arrested last year, has died, his lawyer told Hungarian media. He was 98. Csatary was accused of sending more than 15,000 Jews to the Auschwitz concentration camp in the spring of 1944. Csatary was arrested in June 2012 after a Jewish rights organization discovered him living in Budapest. The Simon Wiesenthal Center considered him its most-wanted Nazi war criminal. Rebels in an unstable part of the Democratic Republic of Congo have until Thursday afternoon to hand in their weapons to U.N. peacekeepers or risk being disarmed by force. The ultimatum comes amid the latest flare up of unrest in central Africa's volatile Great Lakes region. The 19,000-strong U.N. peacekeeping mission in the country, MONUSCO, issued the deadline on Tuesday. It's the first time it has said it will use its troops there to implement a security area around the city of Goma, by the border with Rwanda. South Korea's government said Sunday it believes North Korea may test a missile around April 10, citing as an indicator Pyongyang's push for workers to leave the Kaesong Industrial Complex by then. 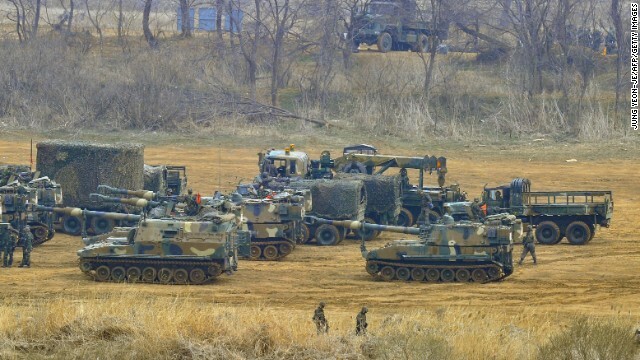 Seoul "is on military readiness posture," said South Korea's Blue House spokeswoman Kim Haeng in a briefing. She said national security chief Kim Jang-soo also based the assessment on North Korea's hint to foreign diplomats in Pyongyang to send personnel out of the country. More civilians in Syria are dying because government forces are using increasing numbers of cluster bombs in residential areas, a rights group said Saturday. Human Rights Watch says its researchers have identified 119 locations across Syria, where at least 156 cluster bombs have been used from August to mid-February. The result is "mounting civilian casualties," the rights group said. Human Rights Watch said it has investigated two cluster bomb attacks in the past two weeks - in Deir Jamal, near Aleppo, and Talbiseh, near Homs. 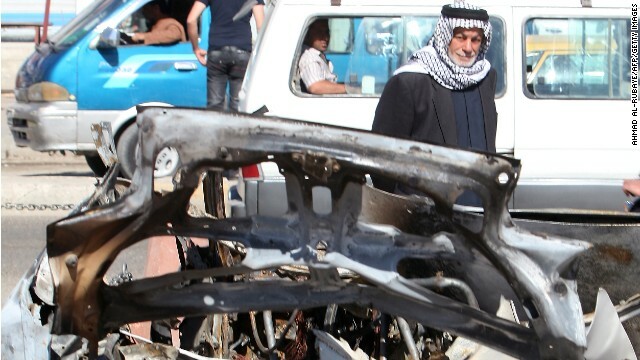 These attacks killed 11 civilians, including two women and five children, and injured 27 others, the rights group said. "Syria is expanding its relentless use of cluster munitions, a banned weapon, and civilians are paying the price with their lives and limbs," said Steve Goose, director of the arms division at Human Rights Watch. Reeling from his doomed cease-fire plan that disintegrated in hours, international envoy Lakhdar Brahimi met Monday with Russia's foreign minister on what to do about the Syrian civil war. It was Brahimi's first meeting with Foreign Minister Sergey Lavrov as U.N.-Arab League envoy to Syria, a position he inherited after other world diplomats also failed to stop more than a year of relentless bloodshed. Brahimi said neither side of the crisis is showing signs of backing down. Someone in an Afghan police uniform killed two U.S. troops today - the latest in a string of insider attacks this year. The attack in Uruzgan Province is being investigated, U.S. Forces-Afghanistan said. More than 50 people have been killed in these so-called "green-on-blue" incidents this year. 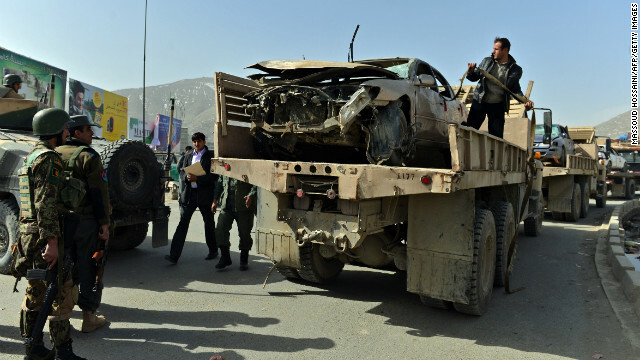 The Afghan government calls the attacks terrorism. It’s already No. 1 on Amazon’s bestseller list. Like little kids with the latest Harry Potter sequel, Washington and the rest of the world will be eagerly thumbing through “No Easy Day” when it hits bookshelves Tuesday. The memoir of a Navy SEAL who helped kill Osama bin Laden in May 2011 purports to tell the full story of how the globe’s most-wanted terrorist met his end. Mentions of the book's author spiked on Twitter on Thursday morning, as did the term "Navy SEAL book." About 4,500 mentions were made by mid-morning. The book was mentioned more than 8,000 times on August 22, when news broke of its release. Carl Carver tweeted, "This sort of thing is NOT healing relations in Middle East, predicted as the starting point of WWIII !" "It seems like once a year since I graduated college I get super excited for a book release, this year No Easy Day by Mark Owen is that book," Drake Stahr tweeted. 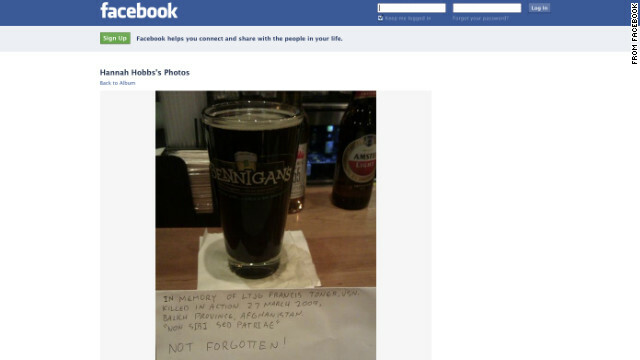 The RangerUp fan page on Facebook, a popular spot for military folks, had a range of comments. 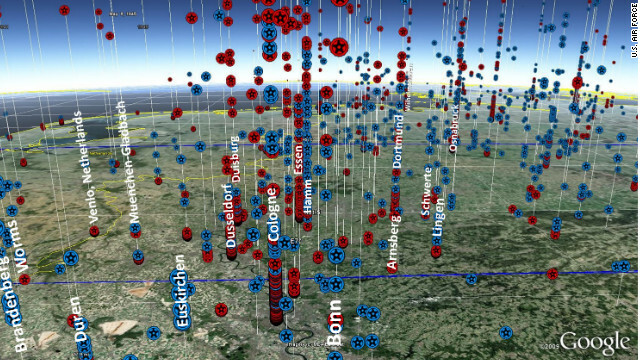 THOR data plotted on Google Earth show British (red) and U.S. (blue) bombings in Germany from 1941 to 1945. A U.S. Air Force officer hopes to soon release a database of bombs dropped from American military aircraft since World War I - a tool he says can be used to shed new light on old conflicts and perhaps even help locate unexploded ordnance. Lt. Col. Jenns Robertson says he began working on THOR, or Theater History of Operations Reports, in his spare time in 2006. It combines information from numerous sources - thousands of paper reports, punch cards and magnetic tape records for older conflicts, and digital databases for others - across nearly 100 years. The database, already being used by the Defense Department and other government agencies, for the first time allows users to search and find on a map nine decades of U.S. bombings. THOR was first reported on this week by The Boston Globe. Robertson started the database when he was part of a briefing team for the Air Force’s chief of staff at the Pentagon. “What drove the development of THOR was ... the data may have been out there, but it was a pain in the rear end to find it and make it useful,” Robertson said by phone Tuesday.